Explanation: Scheduled to illuminate the landscape throughout the night tomorrow, October's bright Full Moon will also be called the Harvest Moon. Traditionally, the Harvest Moon is the Full Moon closest to the autumnal equinox. But in this vacation snapshot, the Full Moon could be called the "Old Faith-Full Moon". 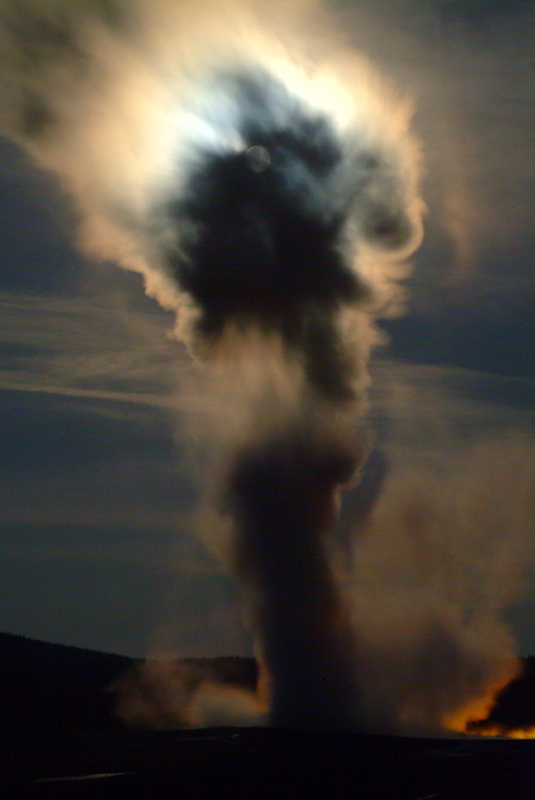 Taken on September 4, the picture combines the regularly occurring lunar phase with Old Faithful Geyser in Yellowstone National Park, named for its dependable erruptions. Shining on the well-known geyser's towering pillar from behind, the moonlight creates an eerie halo surrounding convoluted shapes. Faithfully, the Full Moon itself is bright enough to be seen through the dense swirling steam near the top.